Course Description: SOLIDWORKS Simulation Professional training course provides in-depth coverage on the advanced topics in Finite Element Analysis (FEA) including heat transfer analysis, frequency analysis, fatigue, stability analyisis based on the linear buckling concepts, 2D simulations (plane stress, strain and axisymmetry) and pressure vessel modulus. 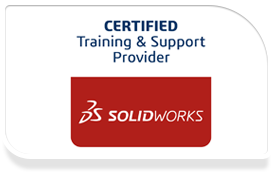 Prerequisites: Students must have attended the introductory SOLIDWORKS Simulation course (3 days) or must have working knowledge of the SOLIDWORKS Simulation software. Knowledge of SOLIDWORKS and basic mechanical engineering concepts is recommended. Who should attend: All SOLIDWORKS Simulation users wishing to create better designs in SOLIDWORKS by performing analysis and evaluating the behavior of their parts and assemblies under actual service conditions.